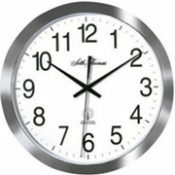 Analog clocks are designed to receive the radio time signal (WWVB) emitted by the U.S. Atomic Clock located at Fort Collins, Colorado. 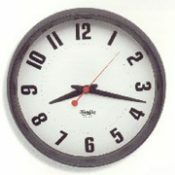 Once received the exact hour, minute and second are displayed. Spring and fall corrections are automatically addressed. U.S. Atomic Clock in Fort Collins Colorado is accurate to + / – 1 second in 1.8 million years. The warmth of wood combined with modern technology. 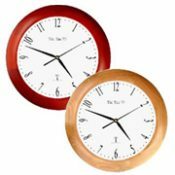 These solid hardwood wall clocks feature a radio-controlled movement which automatically picks up a radio-transmitted time signal from the National Institute of Standards. 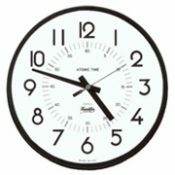 Each day this clock will receive the signal and adjust the time to match the atomic clock. It will even automatically adjust itself in the Fall and Spring for Daylight Saving Time. 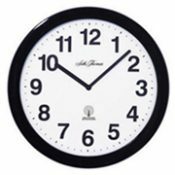 12″ case with 9″ diameter dial.